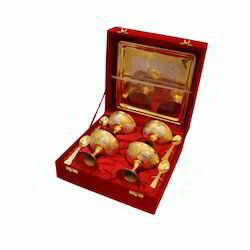 We are one of the reputed organizations engaged in offering A Beautiful Two Ton 4 Aiskrim Bowl With Trey & 4 Spoon which is decorated with latest designs and can be availed in varied sizes and shapes. i am proud to announce that this Diwali you can get innovative gifts for your family, friends and executives. I am a dealer and I deal in silver items. You can order your gift items according to your own taste n budget.For any futher details you can contact me directly. Silver plated square dish with very fine embossed over it. 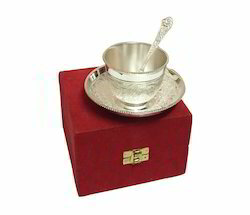 A perfect silver corporate gift or a wedding gift as well. GIFTZ offer a wide range of brass itmes plated in pure silver to gift to your loved ones on Raksha Bandhan, Diwali, or any GIFTZhappy occasion. This product is offered in a very beautiful box packing, and is offered at a very reasonable price. GIFTZ offer discounts on bulk orders.